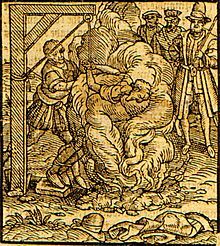 On this date in 1417, the heretical knight John Oldcastle was burned at St. Giles Fields. Oldcastle was a country gentleman who helped King Henry IV put down the Welsh and married up, into the Cobham family. He became good friends on campaign with Henry’s heir, the future Henry V.
Though Oldcastle was a privileged member of medieval England’s 1%, he supported positively dangerous change. In Oldcastle’s youth, the radical preacher John Wycliffe was abroad in the land, and Oldcastle at some point — nobody seems able to say exactly when — cottoned to the egalitarian movement Wycliffe spawned, Lollardy. A century-plus ahead of the Protestant Reformation, Lollards challenged the corruption and impiety of the Catholic Church, urging adherents to look to the scriptures themselves. Protestant writer John Bale later reclaimed Oldcastle as a proto-Protestant martyr. The truth of it is, that after he had once throughly tasted the Christian doctrine of John Wicliffe and of his disciples, and perceived their livings agreeable to the same, he abhorred all the superstitious sorceries (ceremonies, I should say) of the proud Romish church … He tried all matters by the scriptures, and so proved their spirit whether they were of God or nay. He maintained such preachers in the dioceses of Canterbury, London, Rochester, and Hereford, as the bishops were sore offended with. He exhorted their priests to a better way by the gospel; and when that would not help, he gave them sharp rebukes. This sort of thing gave right-thinking Christians the vapors. 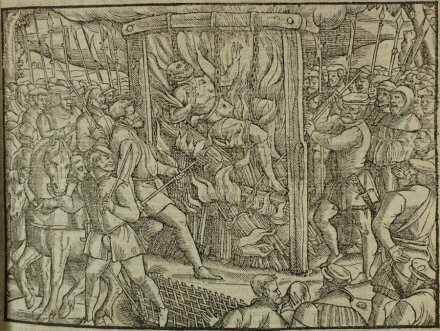 It was in response to this “perverse people of a certain new sect” that England instituted the law authorizing heretic-burning, which would in Tudor hands become such a prodigious maker of martyrs. Fresh to the throne as a 27-year-old, Henry V didn’t want to consign his old buddy to the flames, and generally stalled prosecution and leaned on his friend as much as he could. But his friend remained obstinate in his errors, and eventually delivered a confession squarely rejected the Church’s authority. 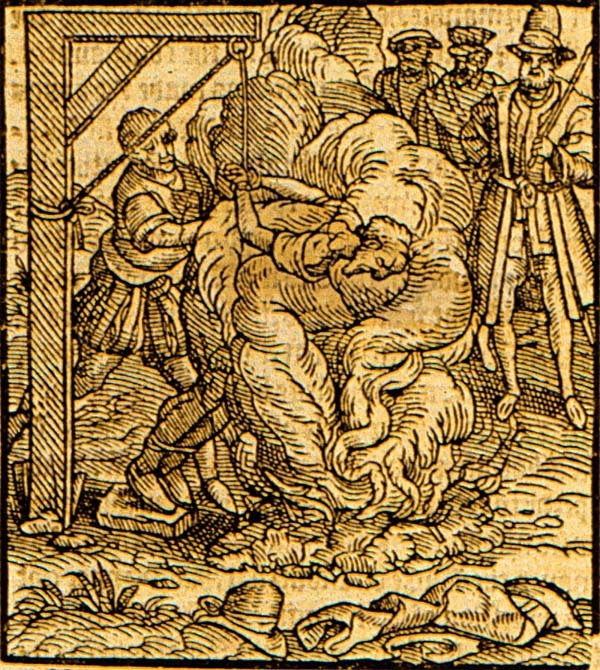 Doomed as a heretic, Oldcastle busted out of the Tower of London when his sentimental sovereign gave him a lengthy reprieve — whereupon the condemned fugitive began fomenting rebellion with his outlawed movement. although the King by proclamation promised a thousand markes to him that could bring him forth, with greate liberties to the Cities or Townes, that woulde discouer where hee was: by this it maye appeare, howe greatly he was beloued, that there could not one he found, that for so great a reward would bring him to light. * Cadging the name from another Hundred Years’ War soldier, John Fastolf. ** The Lord Cobham whom Shakespeare wished to avoid offending was involved just a few years later in the anti-Stuart Main Plot — and only spared execution by a last-second pardon while he was literally standing on the scaffold.